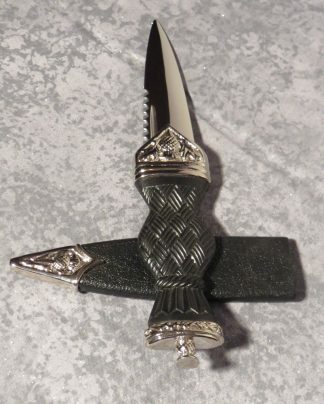 The silver crowned shape pommel on this Circa 1900 Sgian Dubh holds a dark amber colored stone. The front of the grip has Celtic knot work style rope work carved into it. 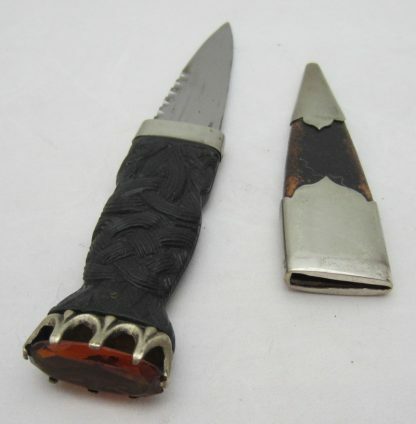 This Circa 1900 Sgian Dubh has a silver crown shaped pommel. It holds a dark amber colored stone. The front of the grip has rope work carved in it in a Celtic knot work style.